Oh hello everyone, Welcome back! Hope you enjoyed my sneak peek projects yesterday the day #1. Today I have two more projects to share using two more new products from Taylored Expressions. All these products will be released on Thursday the 6th of April. The first product I am showcasing is my favourite in the release. 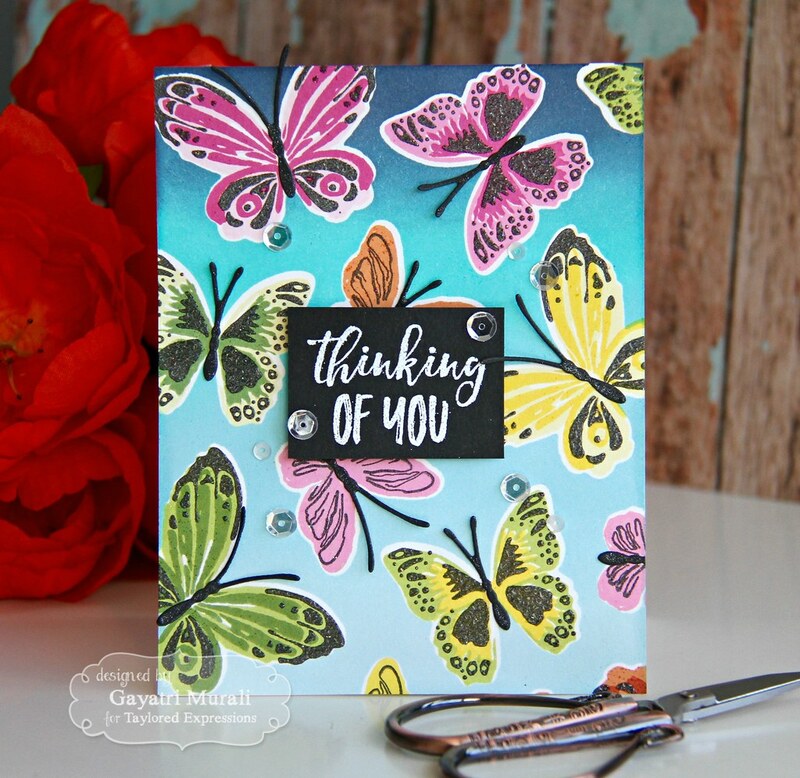 This is a new stamp set and coordinating die in the Simply Stamped series called Simply Stamped Butterflies. This is a layering stamp set. So pretty and I love it. Here is my card using the stamp set and coordinating dies. 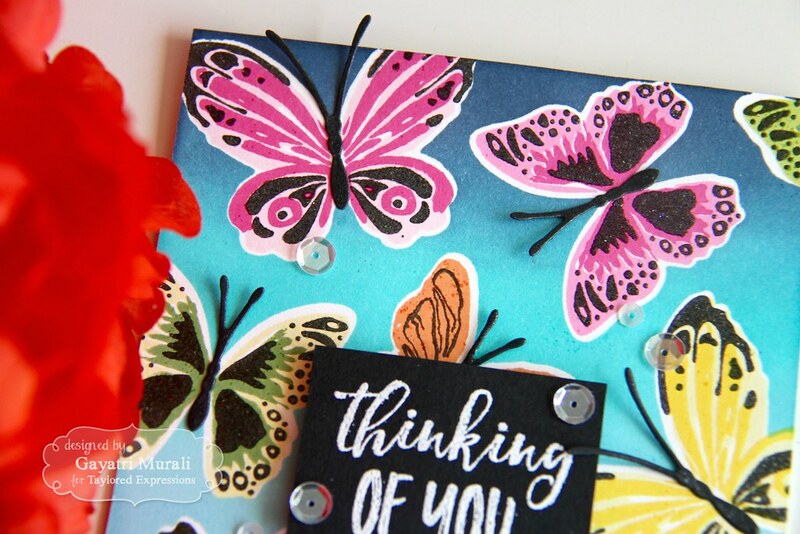 To make this card, I die cut the butterflies using masking paper and randomly adhered on a Sugar Cube cardstock panel. I then sponged TE dye inks – Saltwater Taffy, Sprinkles, Cookie Monster and Blue Corn using the mini round blending tool. Then I removed the masks and stamped the butterflies layering them with various TE dye inks. The green butterfly has the first layer of Granny Smith TE dye ink and second layer Peapod TE dye ink. The yellow butterfly has Potato Chip TE dye ink as the first layer and Lemon Meringue TE dye ink as the second layer. The Pink butterflies have Strawberry Milkshake TE dye ink as the first layer and Lollipop TE dye ink as the second layer. Some of the other butterflies have Lemon Meringue TE dye ink as the first layer and Granny Smith TE dye ink as the second layer. These two ink are not the shades of same colour but next to each other. So they work well. The final layer I stamped ink Oreo TE hybrid ink and stamped with versamark over it to clear emboss it. 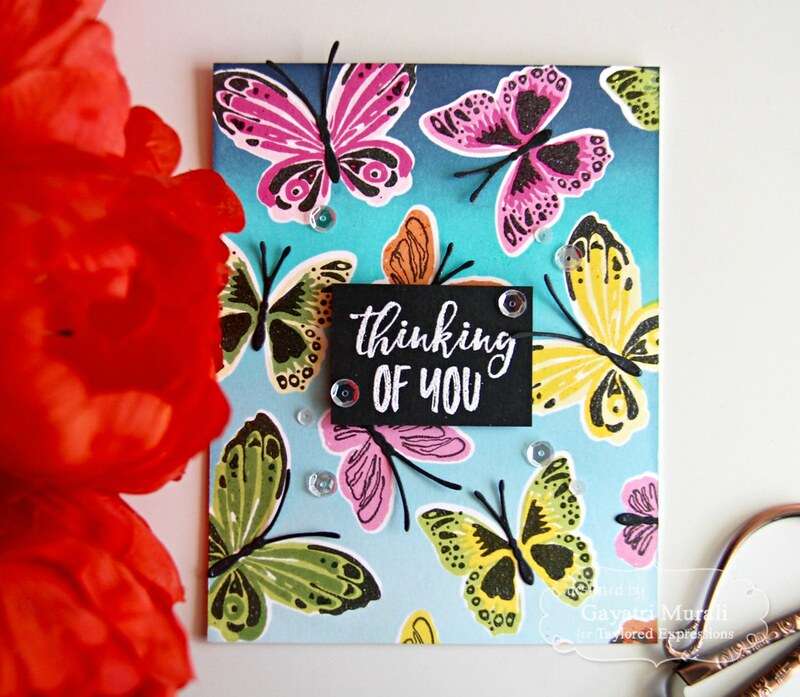 This adds dimension and texture to the butterflies. 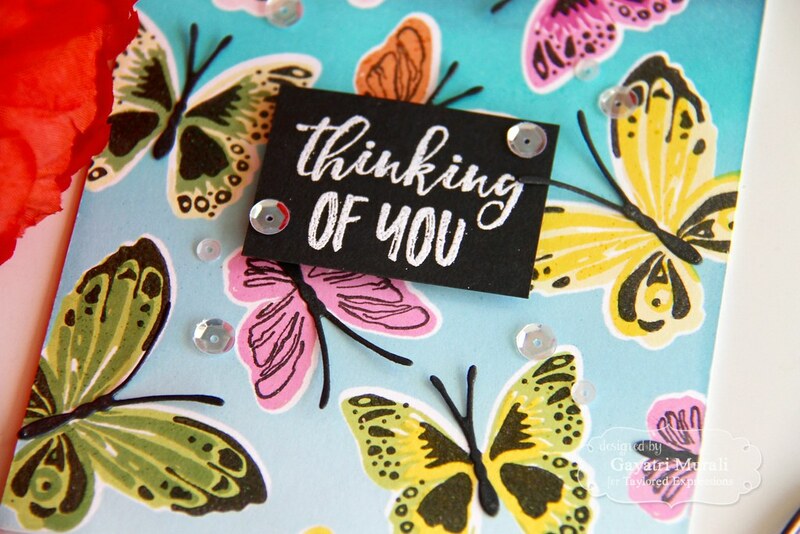 The body of the butterflies I die cut using Oreo cardstock and coordinating dies. The background panel is colourful and busy. I wanted to keep it as the highlight of the card. So I kept the sentiment simple. I white heat embossed the sentiment from the same stamp set on a piece of Oreo cardstock and adhered on the centre of the card front using foam adhesive. Finally embellished with sequins from Snow Flurries sequins. Here are some closeups. Listed below are the supplies used to make this card. 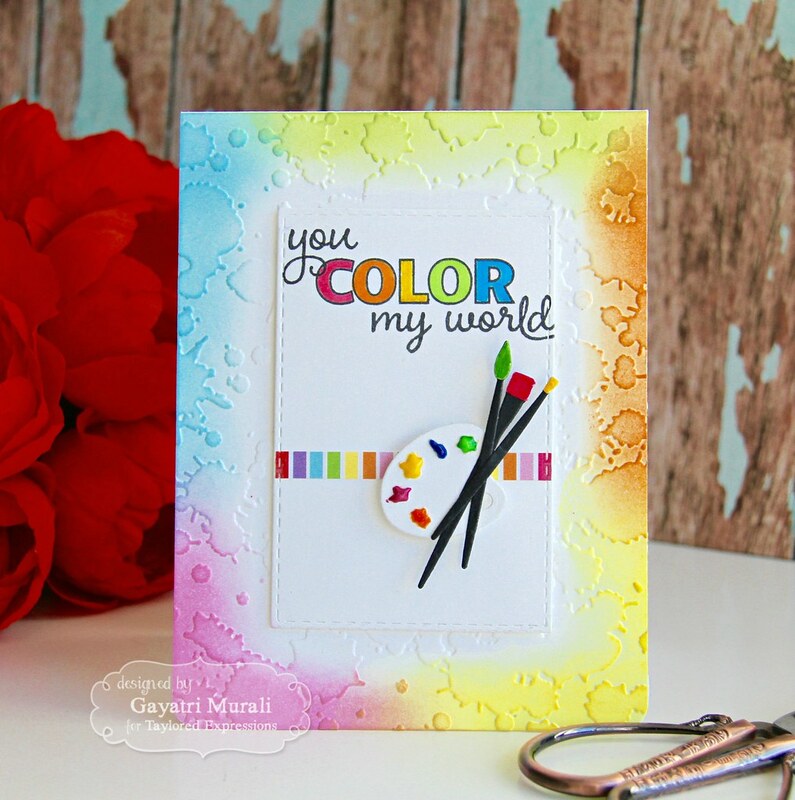 The second product sneak peek from the new release is called Little Bits Paint Brushes dies. These are cute tiny weeny paint brushes that go well with Little Bits: Color Palette die also new this release. I have combine these two dies with couple of older products – a stamp set called A life She Loved and Splatter embossing folder. I embossed the background with the Splatter embossing folder and sponged the edges with TE dye inks Granny Smith, Lollipop, Lemon Meringue, Candy Corn and Cookie Monster. For the focal panel, I die cut a stitched rectangle die using Sugar Cube cardstock. Stamped the sentiment on top of the panel from A Life She Loved stamp set and coloured the space inside the word “COLOR”. 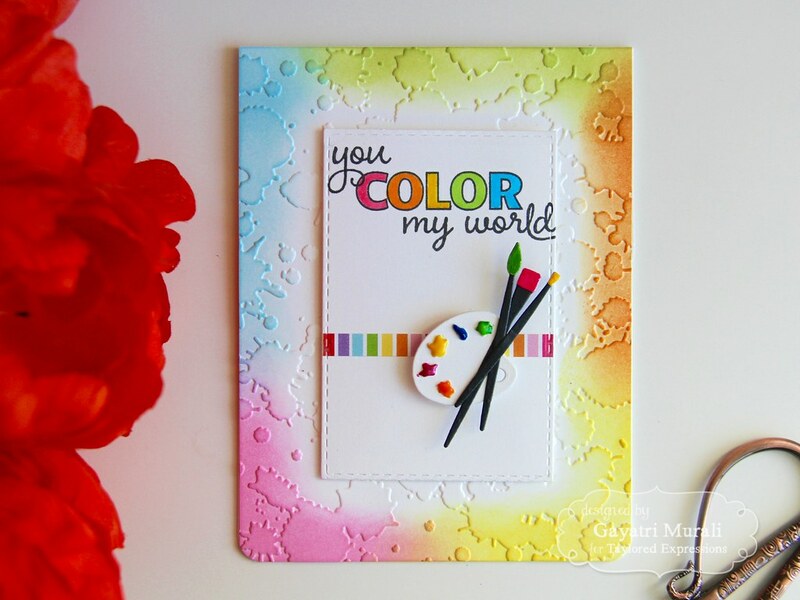 I added a strip of the rainbow pattern paper from Rainbow Brights 6×6 pattern paper pack. Then I added the colour palette die cut with the paint on it using Nuvo Crystal Drops. The Nuvo crystal drops not only adds colour but also the dimension to give the real colour blob feel on the palette. I then die cut the paint brushes using Oreo and Sugar Cube cardstock. I coloured the brushes tips with copic markers. I added a cluster of brushed on the edge of the palette. I adhered the completed panel on the card front using foam adhesives. Check out Taylored Expressions Blog for gorgeous inspirations from Taylor and the design team. I will see you tomorrow with day #3 sneak peeks. These are so pretty and sweet, Gayatri! LOOOOVE YOUR COLORS! This is for sure my favorite butterfly stamp yet. Mine too, Janet. Thank you for your lovely comment. 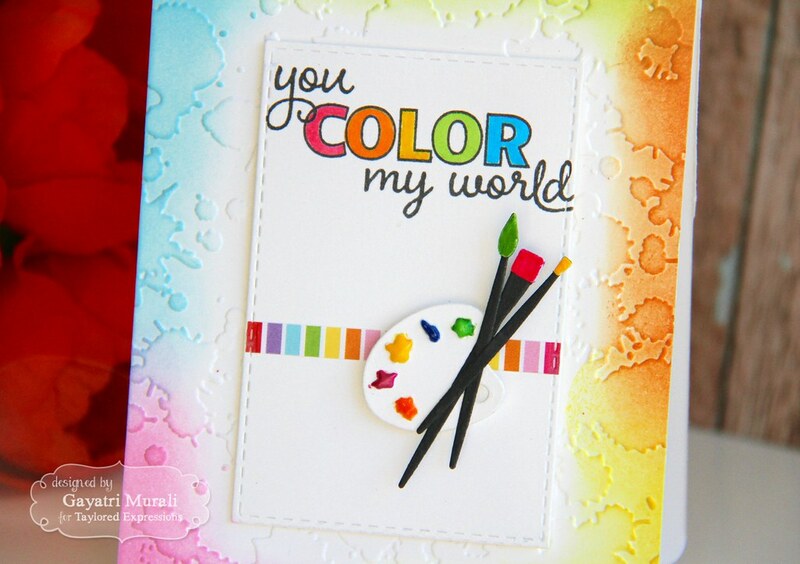 I love your colourful cards….so beautiful…!! Thank you so much Pri. I just love your butterflies card.